Every once in a while, a truly spectacular guitar is made; one that defies the logic of even really great instruments. The Martin Custom 000-14 Guatemalan is one such instrument. Jason Sarra, one of the principals at N Stuff Music, personally hand-picked the woods for this Martin. The top is high-altitude Swiss Spruce, the back and sides are Guatemalan Rosewood, with flamed Koa binding; the fretboard is ebony, and the bracing is Adirondack Golden Era. I would describe the guitar as acoustically big and present, with a relaxed midrange. Unlike some instruments that have a stiffness, as far as playability goes, this one is easy to play, even with a medium to heavy gauge string. This is the type of acoustic guitar that needs only a microphone with which to record. 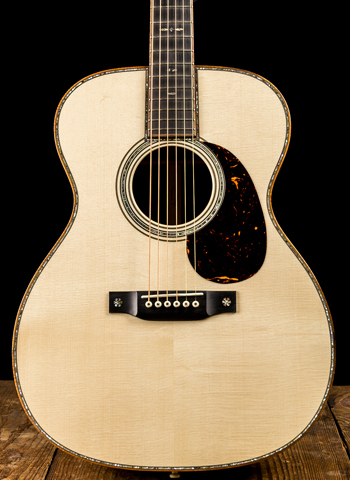 N Stuff Music is proud to be an authorized Martin dealer, and excited to have a Martin of this caliber in our store.